Knock-Out Drum | Pentek, Inc.
[:en]The Pentek Knock-Out Drum is the perfect accessory to your HEPA vacuum waste collection scheme. When inserted between the waste and the VAC-PAC®, you are assured of trouble-free, automated operation with no downtime and minimum maintenance cost. The Pentek Knock-Out Drum provides continuous clear liquid extraction from hazardous materials collected during your waste cleanup and removal operations. The Knock-Out Drum is offered with lead paint removal, PCB clean-up, and nuclear decontamination applications in mind, though it can handle most non-combustible wet waste. 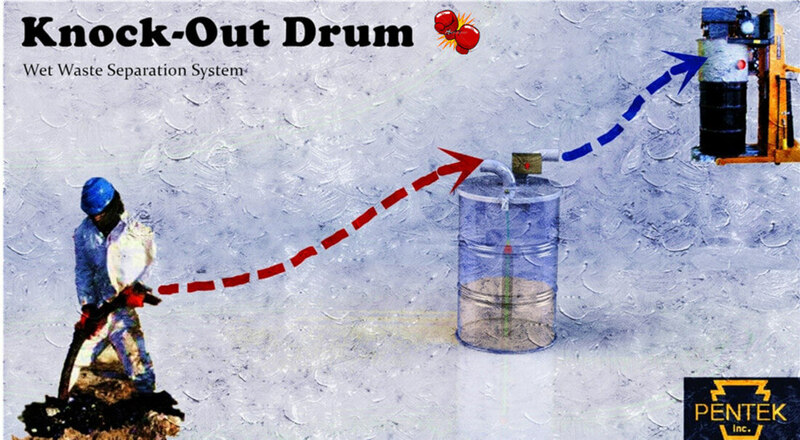 Whether it’s thick sludge, slurry, or particulate-contaminated water, the Knock-Out Drum will extract and discharge clear water from the waste stream, leaving behind only the solid waste to accumulate in a standard, DOT-certified, 55-gallon waste drum. a discharge hose to the clear liquid extraction port. Once the battery-powered lid-mounted level detector signals that the drum is full, simply detach the hoses, swap the transfer lid for a standard lid (included), and the filled drum is sealed and ready for disposal. And since no one has to handle the waste in the drum, the safety of the workers and the nearby public is never compromised. All hoses connections are standard sizes, and can be custom-tailored to your specifications. Custom engineered drums and waste containers can also be provided. Please for contact us for further information concerning your particular project requirements. The Pentek Knock-Out Drum is the perfect accessory to your HEPA vacuum waste collection scheme. When inserted between the waste and the VAC-PAC®, you are assured of trouble-free, automated operation with no downtime and minimum maintenance cost.